I'll wait until they are available in EU so I don't have to pay 100 euros extra for customs. Thanks for the tip, placed the order since they replied to me that they can ship in 1-3 days. Do the ST-9071 come with E-tube cables to connect to the junction box or do these need to be purchased separately. Thanks! Do the ST-9071 come with E-tube cables to connect to the junction box or do these need to be purchased separately. ST-9071 and SW-9071 have fixed E-tube cables that are 600 mm long. BTW, does anyone know of a shop that has the SM-EW90-B in stock? that's the 5 port one right? I'm still waiting on mine. Can you tell me does it have the charging port for on board charging?? Will that work for both the internal or external battery?? I have just received my junction box (SM-JC40) and top 3 port connector (SM-EW90-A) and wired the whole system up with my SW-R671 bar-end shifters, and nothing happened. I then substituted the 3 port connector and bar-end shifters with the standard SM-EW67 and normal drop-bar Ultegra STI units, and everything worked fine. Plugging the bar-end shifters into the satellite ports and they worked fine. No combinations using the 3 port SM-EW90 connector resulted in any action at all. No firmware updates - one assumes I need the USB connector to do so? Is this a common scenario? I think you may need the 5-port connector. 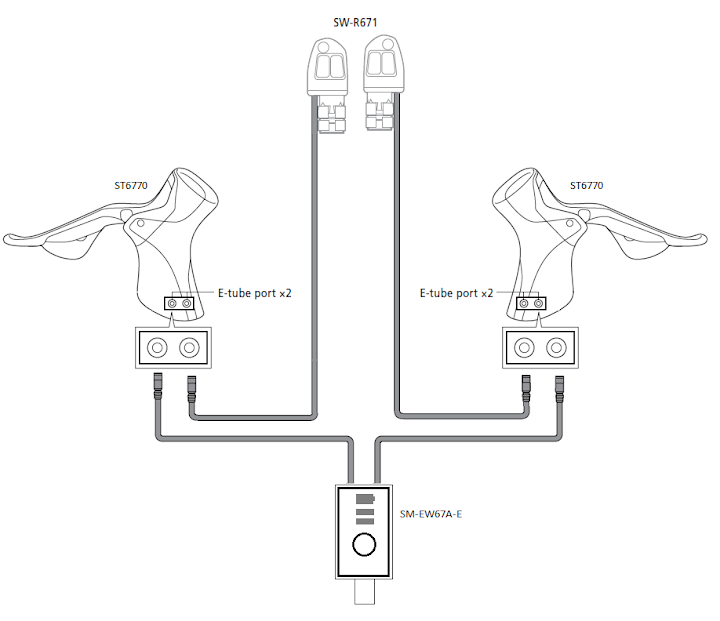 According to the Shimano diagrams, the R-671�s do not connect to the ST-9070. Well, firstly I'm not using the ST-9070 levers, I'm going to hack my own, but at this stage that isn't relevant. Any assistance would be appreciated, and if I can avoid spending �163 on a PC interface or �115 on a 5-port junction when I'll only be using 3 ports that would be great! Have you solved the ew90b problem? My rig is configured identically to yours and has been working successfully with the 3 port junction box (ew90a) Now that I have finally received the brake shifters and replaced the 3 port with the 5 port (ew90b), I can't get it to work. Basically the ew90b doesn't power up? Same problem here and the local Shimano rep confirmed that a firmware update is necessary. Thanks for the info, looks like I'll have to buy a PC interface then, as I doubt many shops in India have one! Just another quick query, do I need a spare port to plug the interface into, as that would mean swapping to the 5-port junction, or can individual components be flashed with new firmware in isolation? The Shimano rep said that you can flash the components in isolation. But you must plug the interface into a female port. Same problem here. Finally got the SM-EW90-B and nothing works. Totally bummed. I have the internal battery coming as well as the charger which also doubles as an interface from what I have been told. So I hope that a firmware update is all I need to get the 5 port junction box to work. Anyone know of North American supply of the brake/shifters? Have not found any in stock on the sites I checked last week. Sorry to hear the 5-port junction isn't working for you. I'm not sure why it's working fine for me. I have only the SW-R671 bar-end shifters attached and I'm using the internal battery. I hope you get it fixed soon. 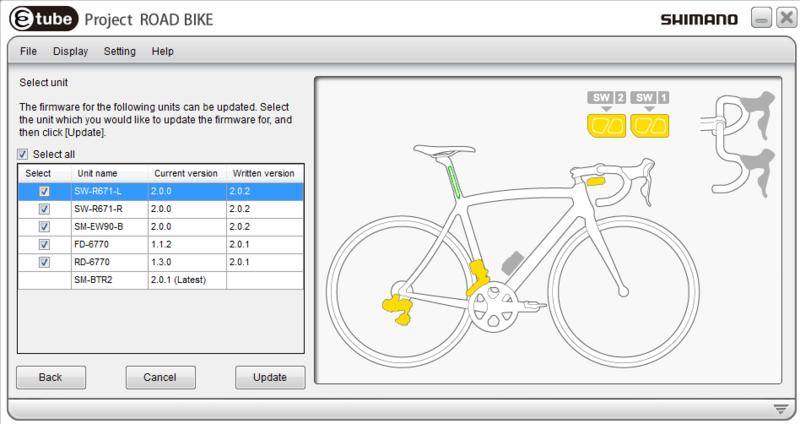 I ordered the Di2 PC Adapter to update the firmware and switch the upshift/downshift buttons, but it hasn't arrived yet. I haven't found the brake/shifters anywhere in North America yet. I have only the SW-R671 bar-end shifters attached and I'm using the internal battery. I hope you get it fixed soon. I ordered the Di2 PC Adapter to update the firmware and switch the upshift/downshift buttons, but it hasn't arrived yet. Why did you do that? The SM-BCR2 charger for the internal battery is a PC interface for updating the firmware and making changes to the components. That's hilarious - I had no idea! I wondered how I missed something so obvious, but the box, instructions, and label on the SM-BCR2 all say "battery charger" and make no mention of any additional functionality. Well, to be completely fair to Shimano, they do say it in the User's Manual. See the segments "Features" (top of the right half) and "Downloading application" (bottom of the right half). Why they don't advertise this feature more strongly, is beyond me. Maybe to push sales of the SM-PCE1? That is very useful to know, especially as it's half the price of the PC interface unit. I just got my SM-EW90-B 5-port junction box from Europe. I upgraded to the latest firmware. I now have a functional Ultegra Di2 TT system with ST-9071 shifters/levers and SW-R671 shifters. I'll post photos when I can. Pretty cool!